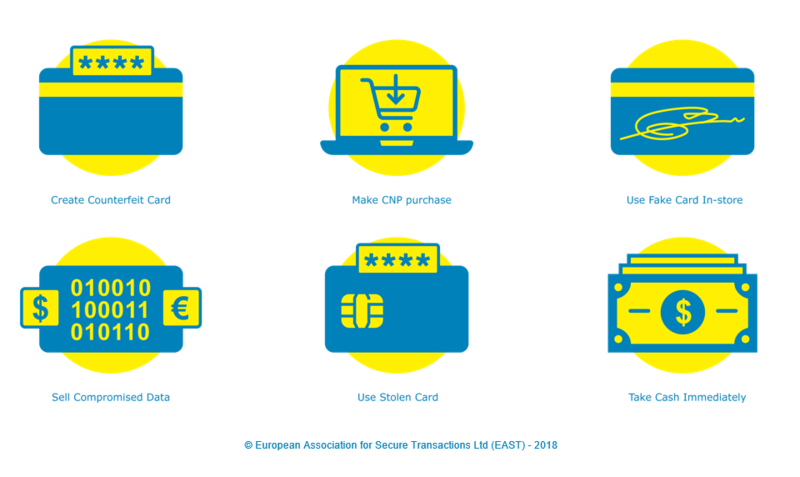 The Terminal Fraud Definitions used by EAST when issuing Fraud Alerts, or when compiling the statistics and other information for European Payment Terminal Reports and Fraud Updates, are shown below. The definitions for Terminal Related Fraud Attacks have been prepared by the EAST Expert Group on All Terminal Fraud (EGAF) and also illustrate what the criminal target outcome is for each fraud type. A summary document is available for view or download at the bottom of this page. The aim is for these Terminal Fraud Definitions, as well as the related criminal benefits, to be adopted globally when describing or reporting payment terminal fraud. EAST also publishes Terminology for Locations of Card Data Compromise (CDC) Devices at Terminals, Payment Fraud Terminology, Payment Fraud Definitions, and Terminal Physical Attacks Definitions & Terminology. Each fraud type defined below has distinct criminal benefits and, in order to help understand these, EAST EGAF has come up with six ways that that criminals achieve their target as shown below. The applicable criminal benefits are shown next to each fraud definition.